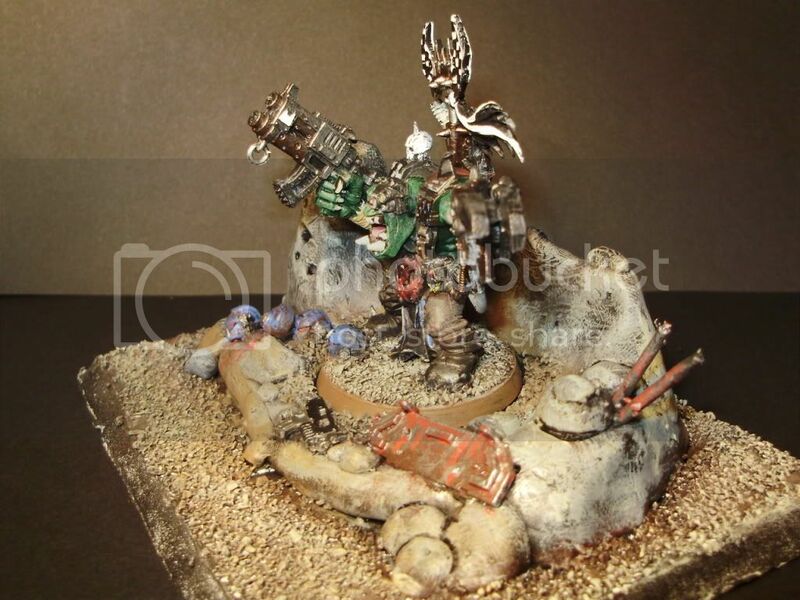 Post your submissions for the Diorama category here. 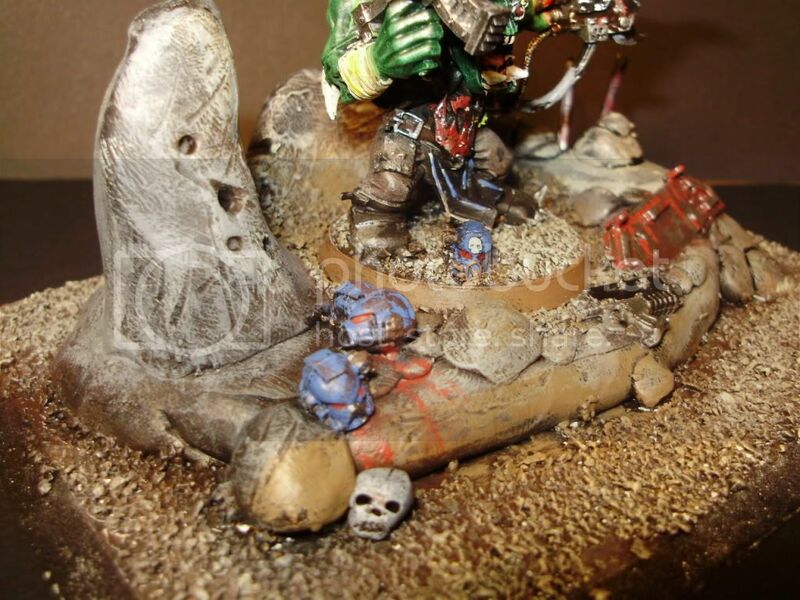 Here is my 3rd submission, this time its featuring my Goff Warboss, StompsLots. 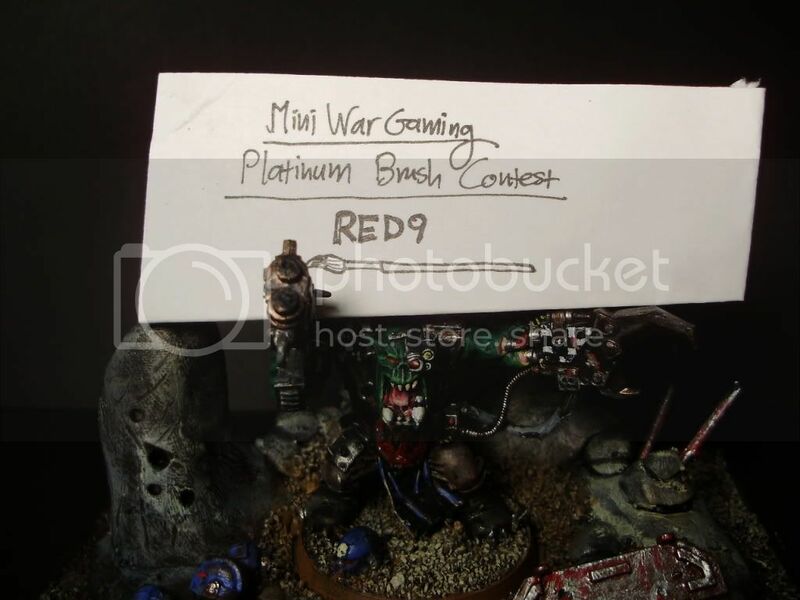 He is a Gemini and likes to take long walks on the beach... Oh and stompin' Ultramarines. 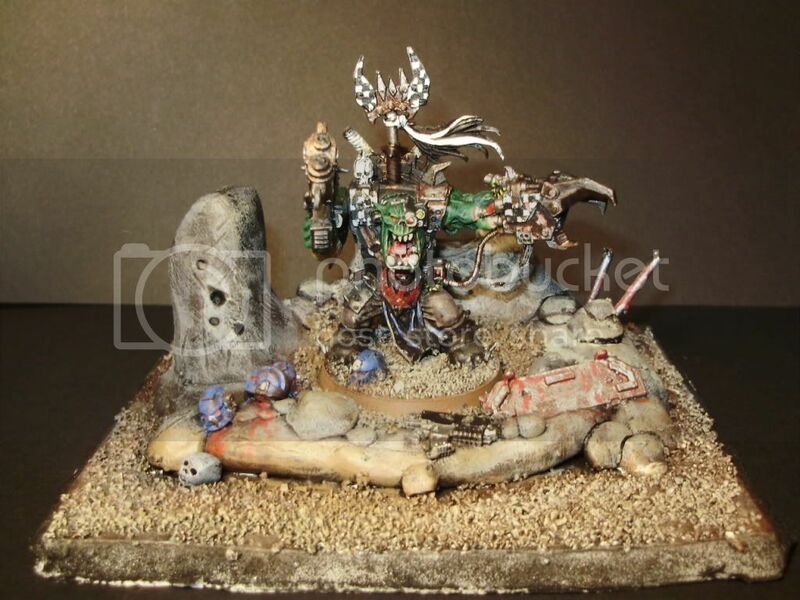 Although the base was made specifically for the Warboss, the Diorama fits well with any other Large-based figures. The stone structures were made from super-sculpey, which is a clay-like material that hardens when baked. 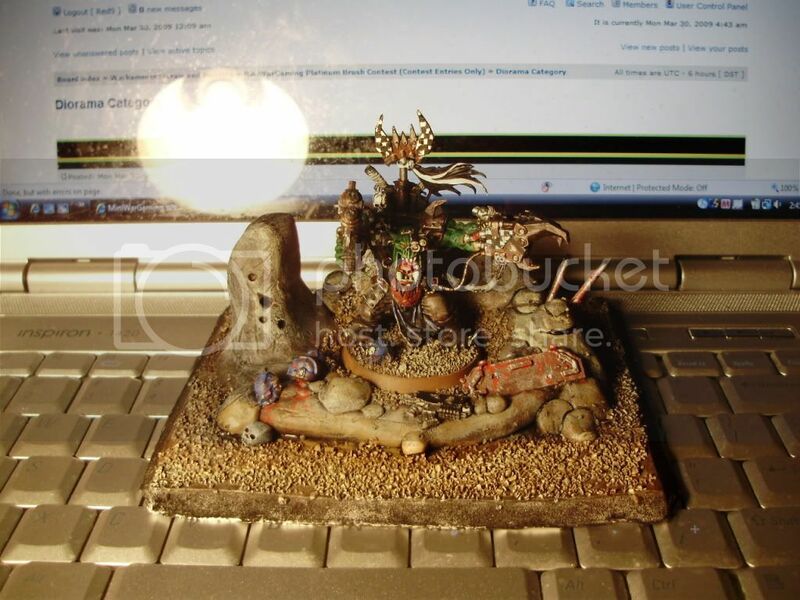 The Warboss was actually painted in the 22 minutes it took to bake the sculpey. The sculpey base is mounted to a 4x5 foam board so it can stand better (Some warping happened while it baked). Then the hardest part: Sanding the scene. Since I live in a tiny college dorm, I dont have the precious space of a garage or the outside. I ended up sanding it in the Bathroom sink with a sheet of paper at the bottom to catch falling sand. Then I did the stupidest thing and accidentally dropped one corner of the paper while lift,and all the sand went down the drain. So I sat outside scraping tiny gravel from the school parking lot, a lady asked if I was alright, and some dude asked me if I was drunk. So then I finally covered the blasted thing and went to painting. Lets see... The 2 metal poles to the left is a toothpick broken in half. 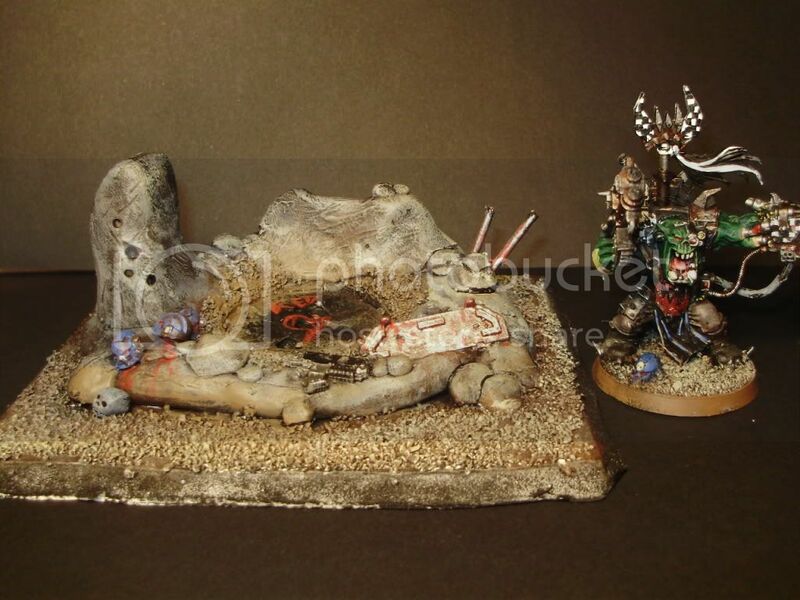 The skull on the bottom right was actually made by me with scupley. I dont remember when I made it exactly, but it sure came in useful today~. So thats it I think. Thanks for viewing, leave a comment, and feedback is always welcome! Last edited by Red9 on Fri Apr 03, 2009 4:02 am, edited 1 time in total. Location: If u look behind u it will ruin the suprise. Buy it, build it, paint it, play it, sell it then start again. Thats my motto! 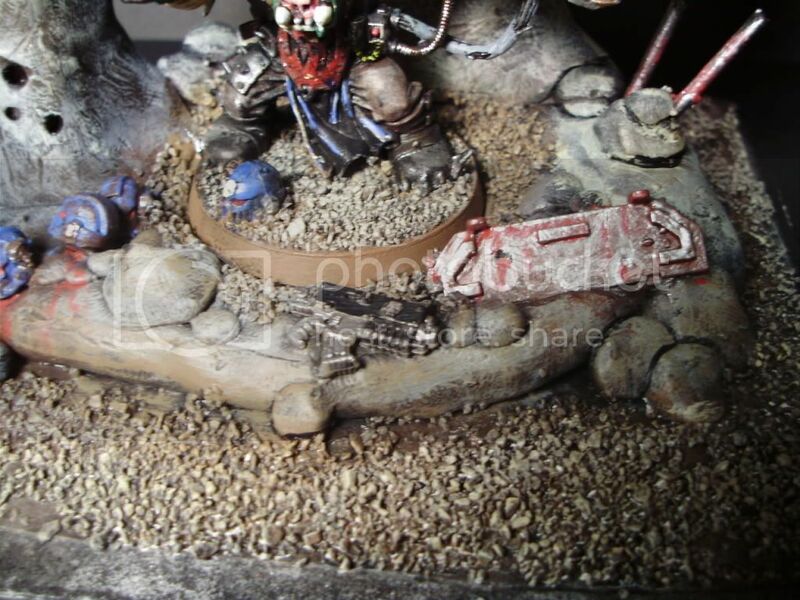 Starting an Ork count as Tyranid army.